In The Man with the Golden Gun, Roger Moore wears a more adventurous wardrobe than he did in Live and Let Die. 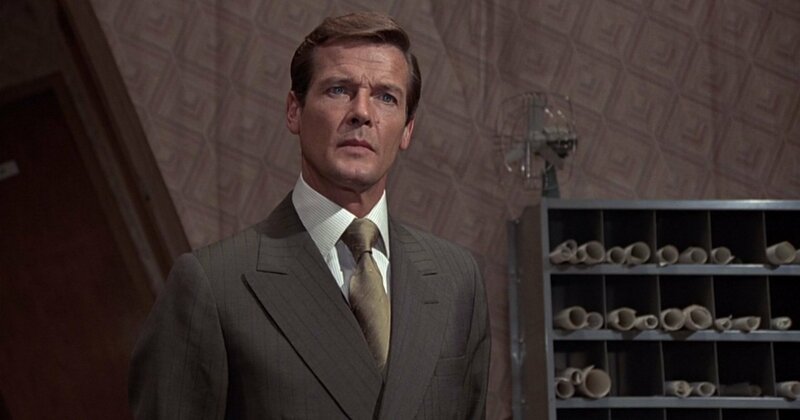 For one of the furthest suits from what Sean Connery had established as the classic Bond look, Moore wears a dark olive multi-stripe, double-breasted suit cut by Cyril Castle. The suit has very closely-spaced tan pinstripes with wider-spaced red chalk stripes. The jacket has six buttons on the front with two to button, deep double vents, slightly slanted pockets with flaps, and flared link-button cuffs. The jacket’s shoulders are narrow and lightly padded with gently roped sleeve heads. The chest is full-cut and the waist is suppressed. The suit’s trousers have a high rise, darted front and gently flared leg. Like the other suits in the film, these suit trousers are most likely worn with a belt. The shirt is a cream and gold bengal stripe in a twill weave, made by Frank Foster. Twill breathes less than standard poplin shirts, but this cloth was likely chosen for its colours and not for its wearability in hot Hong Kong. The shirt has a moderate spread collar, front placket stitched close to the centre and and two-button cocktail cuffs. The tie is light olive shantung silk, tied in a four-in-hand knot. Even though the outfit is in all earth tones, Moore wears black slip-on shoes. But because this suit is worn after dark, black shoes are appropriate, and they don’t clash when not in daylight. For daytime, brown shoes would be a better choice. Even though I am a huge fan of Moore’s wardrobe, this strikes me as one of his least successful efforts. I’m curious, Dan, (as a fellow Moore fan) as to what you don’t like about this outfit? For me, the suit’s colour is one of the most appropriate for Moore’s complexion and the accompanying shirt and tie match beautifully. 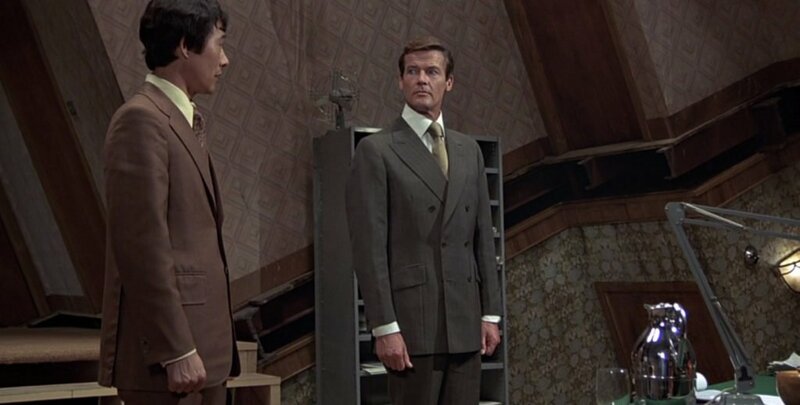 Matt, by synchronicity, I watched “The Man with the Golden Gun” only the other night, for the first time in a couple of years, and while I noticed the olive tonal stripe in this suit, I couldn’t make out a red stripe at all. Also, might the shoes have been a dark brown, which would match this outfit somewhat better than black? I like the suit but Moore looks like a model for Canali, most definitely not like James Bond. But that was the whole problem with Moore anyway, the most unconvincing of all 007’s. How would he have drawn his gun from his shoulder holster with that double breasted jacket? That was one of my (many) complaints with Moore’s Bond. Obviously they weren’t going for realism (or even Fleming-ism) but I thought it was great when Dalton reverted back to a more Bond-ish wardrobe as detailed in the books (at least in intention if not always in execution). Interesting comment, seeing as Jeffrey Deaver chose to put Bond in Canali in the book Carte Blanche. I think that Moore looks his best in The Man With the Golden Gun, despite its weakness as a film. Granted this particular suit is a tad more Lord Brett Sinclair than 007 but the colors work well for his complexion. And that’s a great point about Bond drawing his gun. In general I think a man of action like James Bond should be in single-breasted suits with double vents, but that’s just my personal taste. Moore did look his best in this movie, especially in the navy blazers and the olive safari shirt/jacket. Mixed feelings. On one hand this is so far removed from sartorial cannon, almost nothing about this particular suit is in-keeping from what we have seen previously, or read. Subjectively speaking, I’m just not a fan of double-breasted suits…and they really seems too cumbersome for the 007 character. On the other hand; clearly the producers, directors, writers wanted to create a “different” Bond. 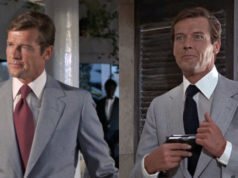 Roger Moore brought his flare for fashion, and the expressions of flared trousers or double breasted suits go a long way in separating his Bond from previous incarnations. Perhaps not the most “Bond-ian” look, but it’s tastefully done and suits Roger Moore’s elaborate personality. I like the suit. And I hope we’ll see Daniel Craig wearing double-breasted jacket in the next movie. What are the chances? Tom Ford favors the style, which, as Moore demonstrates, can look modern without being trendy – unlike some of the suits Craig wore in Skyfall. I guess I agree with Ryan on this one. I think the color is most unattractive and fits right in with the color scheme of the movie. But it also fits Roger’s complexion and personal look at the time, and is very 1974. Overall, unmemorable to my mind. The best thing about this ensemble is the Submariner, the classic Bond watch in the days before Seiko and Omega threw a lot of money at Eon for product placement. I agree on the suit and the watch, but I don’t see how the color scheme of the movie is reflected by the olive suit. The movie has a bright and luxurious feel to it, not drab at all! Christian might be picking up on the less saturated, more natural color grading typical of 1970’s era films in comparison to the trends of 10 years prior. LALD is a pretty good example of natural 1970’s color grading, as is Diamonds are Forever, if not more so. What’s more, as much as I am a sucker for the olives and browns of the 1970’s, DAF’s color grading and locations are so utterly desaturated that the image looks just about as awful as every other element in the film. Even the nighttime Las Vegas car chase looks bland – about the only thing that broke through the lousy lighting and ugly color grading was the red ’71 Mustang. You make good points regarding the color lighting of the 1970s, but my issue is with the movie’s actual color scheme. It is lot of the same range. There’s some interesting ideas being thrown around here, alright. Christian, to be honest, I don’t personally see what it is about this particular suit which makes it look very 1974. A very 1974 suit would have distinctively flared trousers and far wider lapels (this has the usual moderate concessions to the fashions of the time as the rest of his suits in this movie and its preceding one) and it would be likely single breasted. Look at the majority of movies and TV series from that time and double breasted suits, although they were worn, weren’t particularly high fashion or especially prevalent. Moore introduced this style of suit in the last “Saint” series and continued with it in the movie “The Man who Haunted Himself” and “The Persuaders”, prior to Bond, so it doesn’t really reflect the style preference of a particular fictional character (then again Roger Moore played, over and over again, in all his roles, well, Roger Moore, so, as Ryan points out, Bond’s style was Moore’s style, a trend which has continued right up to the present day for the Bond character/actor). Also, the double breasted blazer and grey chalk stripe suit he wears to the office earlier in the movie are the same style and seem to have been well received here on the blog. Can this be, again, the same brown bias (of course, this isn’t true brown but it’s from that family)? I can scarcely wait to see the comments when Matt posts the safari sports coat he wears in the Macau scenes in this movie! “then again Roger Moore played, over and over again, in all his roles, well, Roger Moore”.. haha once again Mr Marlborough strikes gold! I can only agree with the spot-on observation above. Even though the DB suits and especially the DB blazer he wears in this film are very nice I think the single breasted suits are a little more appropriate for the Bond character. It’s a pity we don’t get to see more of the DB blazers though! I’ve always LOVED the Macau safari sports coat, and have been looking in vain for one on eBay. And no, it doesn’t make Bond look like Captain Kangaroo! The color scheme of Golden Gun is very brown/green/tan/yellow, so this olive suit fits in. The movie is bright, but I don’t find it colorful like The Spy Who Loved Me, whose color design pops (and I think Roger looked his best in that movie). But I too share the visceral negative reaction to olive and yellow, neither of which I wear well. David, as usual , you are excellent in your defense of Roger’s wardrobe. In general, I find he occassionally goes off the rails, but that is more a personal taste than inherently bad clothing like some other instances Connery and Dalton put up on screen. As for “1974”, I completely agree, David, that this suit is not what fashion would have commanded, and I have made that defense of Roger’s wardrobe myself elsewhere, but the colors, the tall collar, the fitted DB look very much like a high end, if low-key, 1974 suit. But I agree, the suit doesn’t scream “fashion ’74.” It fits in with other well-tailored Bond wardrobe reflecting the era in which it was created. I don’t really have a problem with this suit, I just don’t personally care for the color and I think it unmemorable, compared to others in the same movie (the Marine Blue in particular is fantastic). And I like the Macau jacket, and look forward to it being covered here. 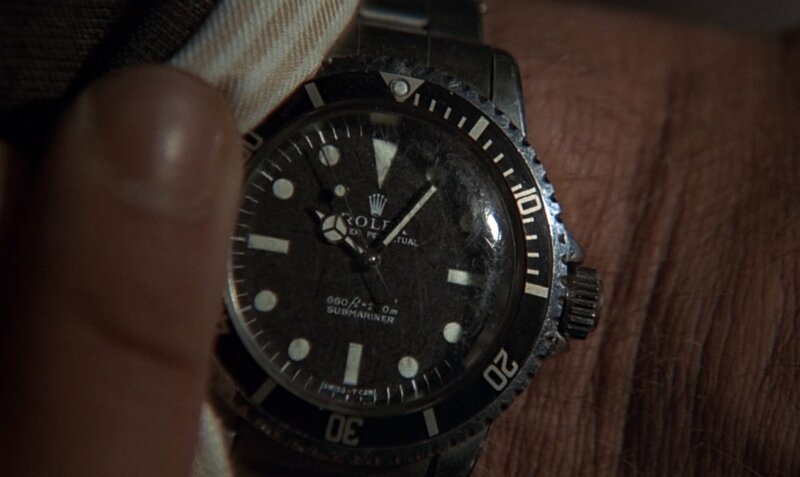 One last off-topic note on the watch – one thing Dalton got right with the Licence to Kill wardrobe was the Submariner, the last Bond to wear Bond’s proper watch before Omega paid a lot of money. I have mixed feelings about this suit as well. I agree with the above comments about double breasted suits not being right for Bond (although I am willing to make an exception for the navy blazers thanks to Matt’s posts). For me this suit would have worked better if it was single breasted like the aforementioned Marine Blue Suit or the Light Blue Suit that hasn’t been posted yet. While I’m not overly fond of the olive color, it would have worked a bit better for me if it had been a solid color (for some reason I have never really liked striped suits – I don’t know why). I personally think a tan or beige suit might have looked better – maybe something like the beige suit from LALD, or one my favorites, Jack Lord’s beige suit from Dr. No. Wow not feeling the love for this beautiful suit! Guys you can’t judge James Bond movies by whether or not a spy would wear a shoulder holster under a double breasted suit! This is James Bond, not a gritty realist spy movie. We are talking about a movie here where a 3 nippled psycopath builds a giant solar-powered raygun – you have to suspend your disbelief at the door or don’t come in. I think the shirt and tie are beautiful. The cut of the suit is immaculate. Wouldn’t wear the fabric myself but it suits Moore. His watch needs a bloody good clean. As a passing aside I was in Turnbull & Asser yesterday and the (excellent) staff were guffawing at how awful Daniel Craig’s ill-fitting Skyfall suits are. So it isn’t just us!! Excellent analysis James St John Smyth. With Skyfall, they still haven’t made it believable that Bond could keep a gun under his suit! Surprised I’m the only one who loves this suit… Sadly I couldn’t wear it with my complexion but I think it’s very distinctive and stately. A bit out of character for Bond I suppose but it doesn’t strike me as *that* out of place, given his usual cover is a traveling businessman. Personally I like it much better than the large plaid blazer worn to Scaramanga’s island that everyone likes, which I think is an eye soar. I might have wanted a tie that picked up some of the red from the chalkstripe on the suit but the shantung silk one is still very congruous and fitting. Just out of curiosity, what’s wrong with the plaid blazer? Granted, it takes some panache to wear something like that, but Moore’s Bond had panache in spades. And the rest of the outfit (solid shirt, tie and slacks) balanced out the plaid (actually windowpane) beautifully! Bond’s Rolex has seen better days.. Sorry if this seems overly pedantic but the plaid windowpane jacket was a sports coat rather than a “blazer”. This is a mix up which I have noticed increasingly in recent years whereby every formally constructed jacket worn with non-matching trousers is labelled a “blazer”, ironically since the time that this particular item of clothing has actually fallen out of general fashion. A blazer and a sports coat have an entirely different heritage and I’m sure Matt would be more effective than me in pointing out the precise differences between the two. Agree, re: this funny “realism” idea and whether a gun is effectively concealed under a double breasted as opposed to a single breasted suit. James St John Smythe, you’re spot on. Furthermore, what real relevance has this argument to a discussion on Bond’s sartorial tastes? He managed to whip out his gun pretty smartly after the Gibson character was assassinated by Scaramanga regardless so that rather nails that red herring anyway! David, I may be wrong, after all I am no American or no English, but I think that in the USA the term “blazer” is often used to refer to sport coats and, generally, to jackets that aren’t sold with matching pants, whatever their cut -similar to a sport coat or to a suit jacket- is. I have seen such jackets denominated as blazers on some American ready-to-wear clothing websites. In Europe, due to its English origin I presume, when we say “blazer” we are often thinking of navy jackets with metal or brass buttons, or of the striped jackets that are often worn in regattas and such kind of nautical events . It’s only recently that I’ve seen non-blazer sports coats referred to as “blazers.” It’s used for an ease of marketing, though it’s not correct. It’s also often used incorrectly to refer to a suit jacket. I wasn’t a fan of this use of the word anyway… Thanks for the precisions, Matt. Sorry, but I am no native American, so my knowledge of some things is obviously not a complete one ! David, the issue of the shoulder holster is relevant as we are talking about James Bond’s suits. I agree it is irrelevant as far as sartorial judgement goes. Being a purist on the 007 films and holding the view that nothing was ever the same again after Thunderball, I agree that we obviously have to suspend our sense of reality in all of these films. Even Sean Connery said as much. However, there is a degree of how much salt you want on your food or how much sugar in your tea. Having said that, I enjoy all of the suits displayed on the blog from a sartorial point of view. The cut is certainly perfect, but the outfit doesn’t really convince me. Every colour of it, and as a matter of fact every colour of the set, from the suit to the walls, looks self-on-self. I think it’s a little too much of a matching. Plus Roger looks rather like a mannequin in this scene. Perhaps a very pale blue shirt could have made the ensemble more pleasant to the eye. On the other hand, I like the idea, as it’s the case here, of having only one lapel buttonhole on a DB jacket. It’s sober, simple and elegant, yet only possible in made to measure or bespoke suits I guess ! I still prefer Moore’s single-breasted marine blue and light blue (?) suits in this movie, that were really nice. Perhaps the Marine blue is my favourite, as far as the 70s style is concerned. Notwithstanding the ’70’s flourishes, this is a fine suit and Moore simply radiates command presence in every scene he wears it in. RE: access to 007’s pistol. The jacket clearly covers much of Moore’s torso. But I saw this film recently and Bond was very quick on the draw when Gibson was sniped down by Scaramanga. My guess:- Q has followed the stage musical tradition and altered the DB suit(s) to feature closure by velcro patches rather than buttons. 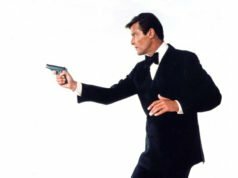 You may recall that M made a reference at one point to outraged tailors wanting to kill Bond. The quick draw is not shown on screen. Bond rarely has a gun under his jacket. It’s only there for when it’s shown. I think Bond’s tailors are humiliated due to the stress he puts his suits through. This is referenced again in Moonraker, after the fall from the cable car. the cloth of this suit is mohair? Wow, the Rolex looks like if it was worn by a rich kid who doesnt know how to treat things properly. The Submariners of the era had acrylic crystals, which were easily scratched and smudged, though it was easy to rub the scratches out. It was difficult to break them. Today’s Subs have sapphire crystals, which don’t scratch but could shatter if dropped. The watch on Roger’s wrist has an acrylic crystal, which often looked like this. Also, the Subs of that era were not the luxury status symbols they became in the 1980s, but were tool watches, meant to be used. I have a friend who collects Subs that are “vintage, beaten up, and used”, in his words (not sure I agree, but that is his view). For that matter, the literary Bond used his Rolex has a knuckle duster in one of the books. And Connery can be seen traipsing around Jamaica, Istanbul, and the Bahamas with his Submariner, with no concern about its treatment. You’re quite right again Christian. The Submariner Ref.5513 had acrylic crystal instead of glass. Looks like Bond has tried to sand out the scratches with something other than car wax, and now he’ll have to put up with them until he can afford to get a new crystal fitted. I believe Rolex, quite bizarrely, persisted with the plastic until 1990. Does an olive colored suit belong in the 70s? Or could some one still wear it today without being a “that 70s show” fan? Olive suits were very popular in the 1990s. In linen or cotton the olive suit is a classic.